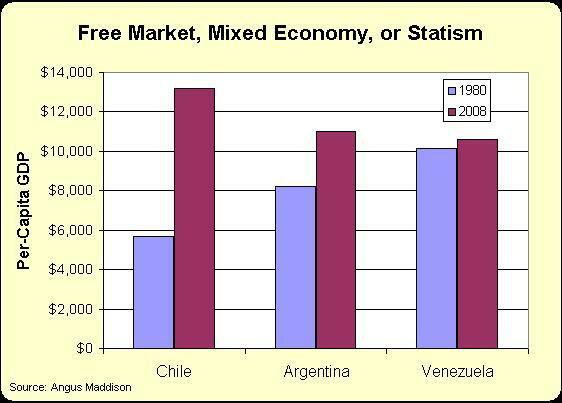 When Hugo Chavez Battles Supply and Demand Curves, Guess What Happens? By 6:30 a.m., a full hour and a half before the store would open, about two dozen people were already in line. They waited patiently, not for the latest iPhone, but for something far more basic: groceries. …Venezuela is one of the world’s top oil producers at a time of soaring energy prices, yet shortages of staples like milk, meat and toilet paper are a chronic part of life here, often turning grocery shopping into a hit or miss proposition. Some residents arrange their calendars around the once-a-week deliveries made to government-subsidized stores like this one, lining up before dawn to buy a single frozen chicken before the stock runs out. Or a couple of bags of flour. Or a bottle of cooking oil. The shortages affect both the poor and the well-off, in surprising ways. A supermarket in the upscale La Castellana neighborhood recently had plenty of chicken and cheese — even quail eggs — but not a single roll of toilet paper. Only a few bags of coffee remained on a bottom shelf. Asked where a shopper could get milk on a day when that, too, was out of stock, a manager said with sarcasm, “At Chávez’s house.” At the heart of the debate is President Hugo Chávez’s socialist-inspired government, which imposes strict price controls that are intended to make a range of foods and other goods more affordable for the poor. They are often the very products that are the hardest to find. …many economists call it a classic case of a government causing a problem rather than solving it. Prices are set so low, they say, that companies and producers cannot make a profit. So farmers grow less food, manufacturers cut back production and retailers stock less inventory. Moreover, some of the shortages are in industries, like dairy and coffee, where the government has seized private companies and is now running them, saying it is in the national interest. Here’s a chart that I’ve used before, using international data to compare living standards in Venezuela, Argentina, and Chile since 1980. One nation (take a wild guess) has tried statism, one nation has tried a mix of statism and capitalism, and the other has tried capitalism. And just in case you need one more reason to despise Chavez’s despotic government, the regime is copying Hitler, Stalin, Mao, and other murderous tyrants in imposing gun control. I’m in Slovakia, where I just returned from some meetings at the annual conference of the Freedom and Solidarity Party. Unlike Republicans in the United States, these people practice what they preach about free markets and individual liberty. Indeed, the SAS Party (which I gather must be Slovak initials for Freedom and Solidarity) is so committed to principles that it refused to join with other coalition members to support the European bailout fund. The same cannot be said about the other supposedly right-leaning parties that were part of the government. Indeed, the Prime Minister’s party wound up supporting the bailout (even though she initially was opposed). Amazingly, these other parties thought the bailouts were such a good idea that they were willing to lose a “no-confidence” vote – paving the way for the Social Democrats to win the most recent election! I guess the analogy is Bush and the other GOP statists supporting corrupt policies such as TARP, which helped pave the way for Obama to get elected. In this analogy, the SAS Party is akin to the tea party, representing honest conservatives and libertarians. By the way, there are a small handful of genuinely good political parties in the world. If we limit ourselves to ones that have legislative seats, SAS is on the list, of course, but I would also include the Reform Party in Estonia, which leads that nation’s coalition government. It’s worth noting that Estonia responded to the recent economic crisis by imposing genuine spending cuts, which helps explain why that nation’s economy has bounced back while other nations are languishing. New Zealand’s ACT Party also deserves a mention, though they’re down to just one seat in that nation’s Parliament. Hopefully they’ll bounce back.